Reviews of music performances, instruments, music books, etc. This sopranino is the tweety birdy of the recorder family. It’s very high pitched with clear notes, though there’s a subtle warbling or vibration. That’s not a sound I’m used to hearing from plastic recorders, so that was a surprise. Like all sopraninos, this is a tiny instrument. The length is about 24.5cm. The distance between finger holes varies from 7mm to 15mm. People with larger fingers will likely struggle to play this. On the other side, it’s a good choice for anyone who struggles with the size and weight of larger recorders. 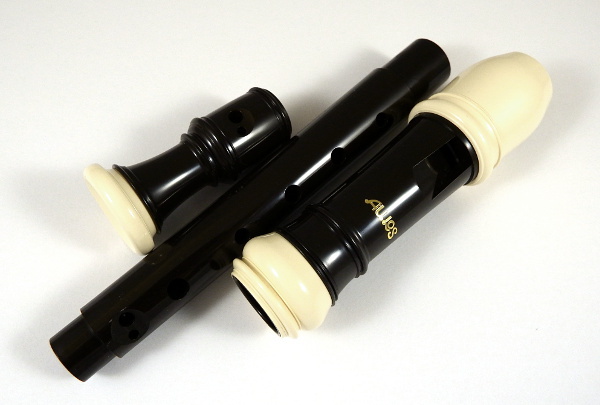 Image Caption: The sopranino recorder on a white background. The recorder is dark brown, with cream/ivory joins and mouthpiece. A simple bird is drawn on the background next to the recorder. It doesn’t require much breath to play, due to the size and the narrow bore. Sounding the notes in the different registers has a few challenges. It’s a little fiddly to partially open holes when they’re so small. But once the hole covering is right, it’s not difficult to get the higher notes to sound. I really liked that it’s in three pieces, rather than two. I tend to have my last finger hole over more than most people, so it was a big plus to be able to move it. The build quality is nice, with no rough edges on the holes or in the bore. The pieces fit together snugly. This is a great little instrument. It’s well made, plays smoothly, and is ideal for those times when I’m having wrist problems. I was pleased with the tone and overall quality of the recorder. Image Caption: The recorder split into three pieces: the bottom piece has the last finger hole (consisting of two smaller holes), the middle has the other finger holes, and the last is the mouthpiece. 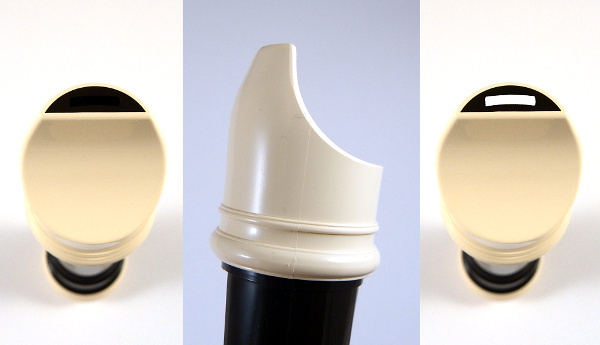 Image Caption: Details of the mouthpiece. On the left is the mouthpiece viewed from the end. On the right is the same view, but with the hole highlighted in white, to show the slightly curved shape of the hole. The middle view is the mouthpiece from the side, showing how it tapers in a curve towards the part that goes in the mouth. 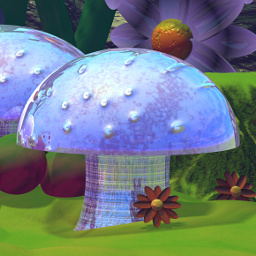 Created partners are a classic of speculative fiction. Usually a person hurt or disillusioned with relationships creates a new partner. The theme stems from a fantasy of having the perfect romance with the perfect partner. But unlike a romance novel, there’s a whole layer of creepiness in creating a perfect partner. It raises questions about free will and slavery. The reality may not turn out quite the way people were hoping. About the Band: The Dresden Dolls consists of Amanda Palmer and Brian Viglione. About the Video: The lyrics and video sum up the creepiness of the created partner trope. The coin-operated boy (Brian) is the wish-fulfilment partner who won’t hurt Amanda, but he’s also “just a toy” who doesn’t get a say in anything. It has a stage theme, with exaggerated stage makeup and scenery like a stage set. About the Band/Singers: Röyksopp is a Norwegian musical duo. Robyn is a singer from Sweden. About the Video: There’s nothing idealised about this relationship, either in the visuals or the lyrics. Flashbacks to the first meeting show a relationship that started well, but grew cold. The robot is not under Robyn’s command, and decides to spend all day working instead of spending time with her. The images of Robyn at home and the robot at work share visual elements, which pulls it together nicely. Also unusually for the created partner trope, the robot is not designed to look attractive. He’s your usual blocky humanoid robot. The Girl and the Robot (YouTube) – I believe this is the official one, but it’s region locked and I couldn’t check it. About the Band: Rhett and Link are comedy duo Rhett McLaughlin and Link Neal. 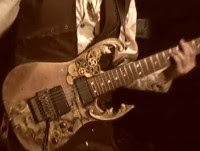 About the Video: This video pokes fun at the robot girlfriend idea, and the male geeks who dream of such a girlfriend. One day, they’ll realise that dating a female geek is a better solution (even if she doesn’t come with built-in Solitaire and may steal your comic books). About the Singer: Olly Murs is a singer from England. About the Video: For those who like the romantic (if still creepy) side of created partners, this video has Olly creating a dream girlfriend (Rose) out of papier mache. His life with Rose is shown, in a very 70s world (possibly the only time when vomit yellow was fashionable). They hang out reading books, pretending to go for drives and eating popcorn. This one is speculative, but it takes a little while to get there.